Supernatural 13x21 "Beat the Devil"
Another late review this week as I'm out of town again! Excuses, excuses, I know. But I was able to just watch the episode this morning, so let's get down to it. Going to keep it short and sweet this week as I'm on a borrowed computer and all. Now that the Winchesters have Gabriel on their team, everything should be good to go to get into Apocalypse World, right? Well, turns out that Gabe's angel grace isn't so juiced up. He doesn't have enough of it to keep the rift open longer than, oh, a few seconds. The only other archangel they know that's still on the board in this world? Dun dun dun... good ole Lucifer. Of course, no one is happy about the idea that they might have to use him to open the rift, but as they see it, there's not much other choice. But how to get him without being killed? Gabe uses some of his trickster magic along with some Rowena actual magic, and they manage to trap him in the bunker while draining his grace into the bowl of ingredients, the idea being that so long as he keeps dropping grace into the bucket, the rift will stay open. It works well...for a bit. 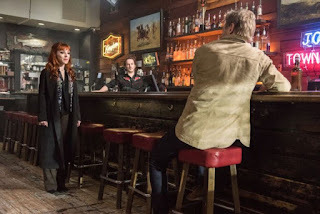 Until Lucifer baits the one left behind, Rowena, into telling him that the boys are not only going to the other world to save Mary, but also to save Jack, which gives down and out Lucifer something to fight for again. He tries to kill Rowena, but she blasts him over into the other world. Meanwhile, in that other world, Dean, Sam, Castiel and Gabriel are walking and walking for days to Dayton, Ohio, where they have heard that Mary and Jack are holed up. But along the way they run into a deranged vampire nest that they have to get through. Sam ends up getting attacked and dragged off, seemingly to his death. Of course, we all know that the Winchesters never stay dead on this show, at least not until the final season, so even though Dean is mourning and all that, the audience is... not. Because sure enough, Lucifer tracks him down and brings him back to life, in order to get on his good side so Sam will take him to Jack. Not sure why he can't detect Jack now that he's in this other world, but whatever. 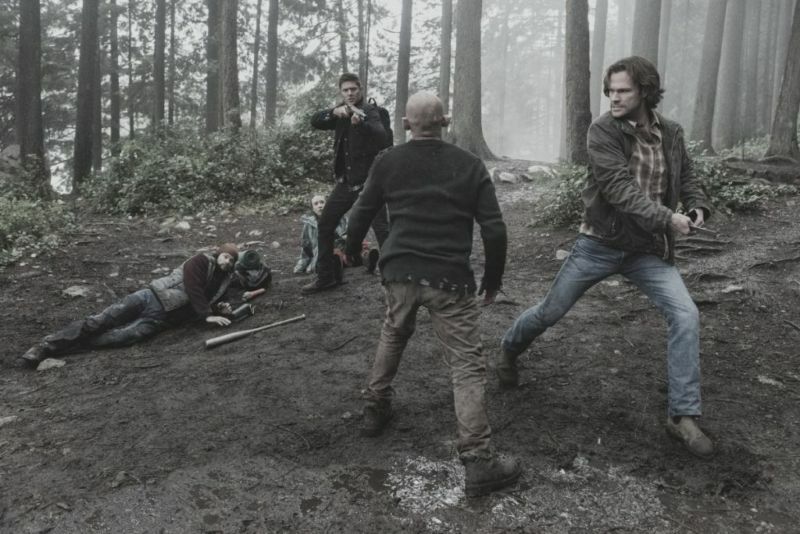 Dean, Cas, and Gabe find Mary and the others, and just as Dean is ready to head back to that tunnel cave deal and get Sam's body, who should walk in but Sam himself. Oh, and yes, Lucifer too. Whatever will happen next?! - Honestly, that tunnel looked like it would've been easy enough to climb on top and and crawl over, but whatever. - Jack can open the portal back to the other world, right? He just hasn't figured out how to do it or something? Convenient. - Cas also told Gabe about the deterioration of Heaven, and how he might be able to help save it. Seems like an easy enough way to get him off the show, but with possibilities to reappear in the future. 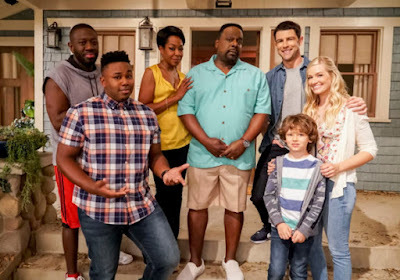 - Last season it was easier to see where the show would be going for the following season, but right now it's pretty unclear where it might be going next. Wasn't really in the position to be writing down quotes, maybe I'll come back and add some when I have a chance.